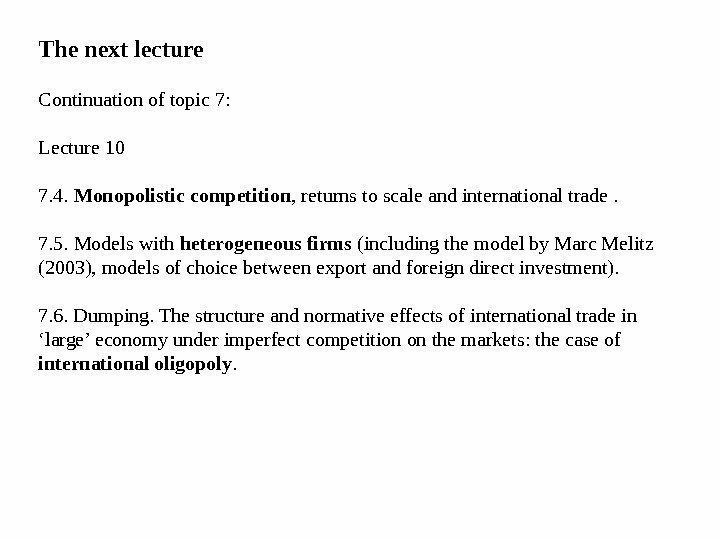 Topic 7. International trade under increasing returns to scale and imperfect competition on the markets. Lecture 9 7. 1. 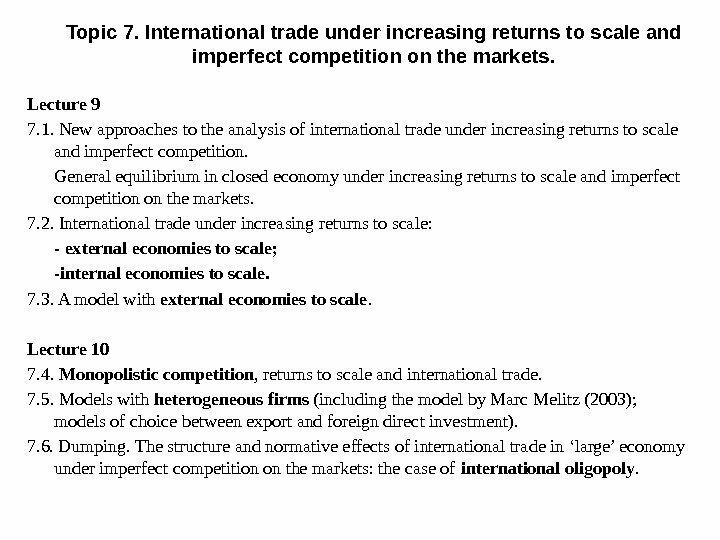 New approaches to the analysis of international trade under increasing returns to scale and imperfect competition. 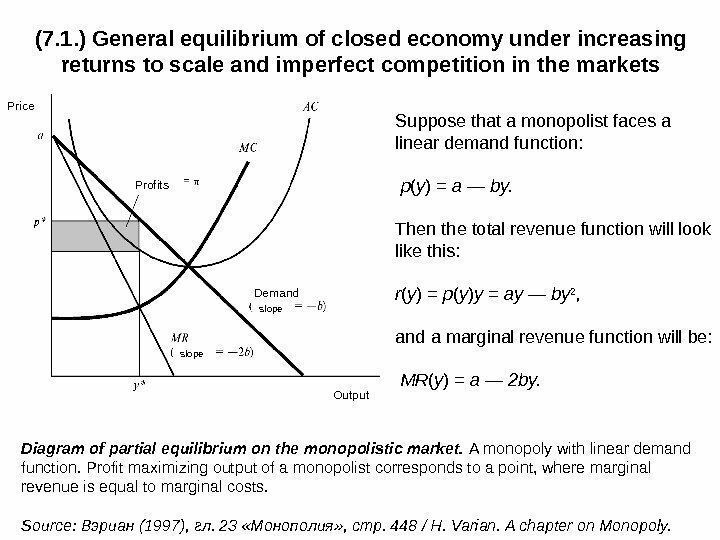 General equilibrium in closed economy under increasing returns to scale and imperfect competition on the markets. 7. 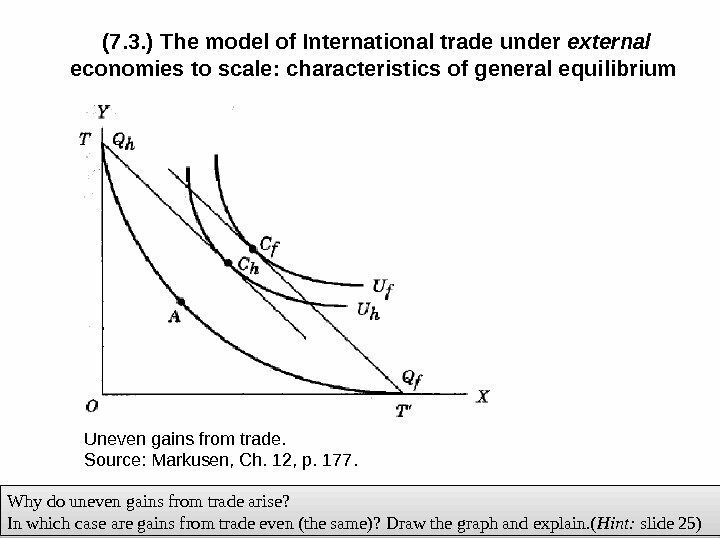 2. International trade under increasing returns to scale: — external economies to scale; -internal economies to scale. 7. 3. A model with external economies to scale. Lecture 10 7. 4. 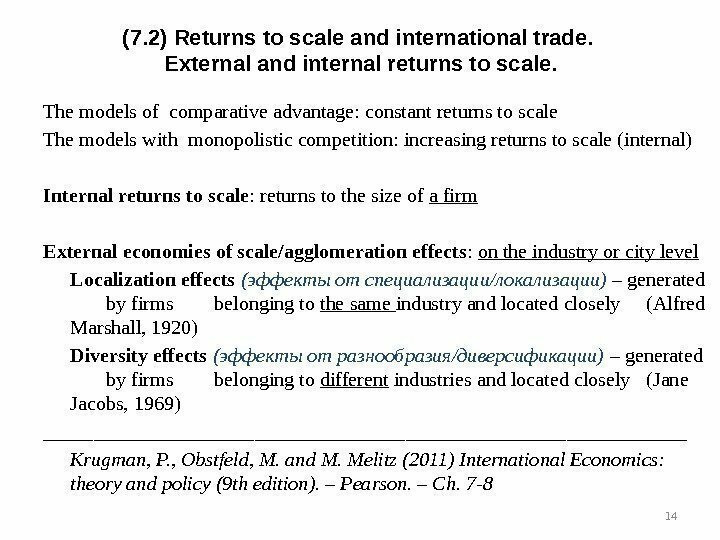 Monopolistic competition , returns to scale and international trade. 7. 5. 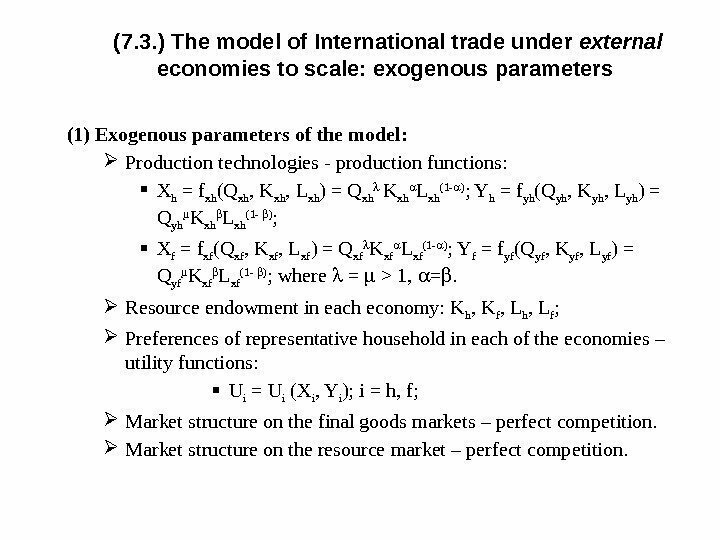 Models with heterogeneous firms (including the model by Marc Melitz (2003); models of choice between export and foreign direct investment). 7. 6. Dumping. 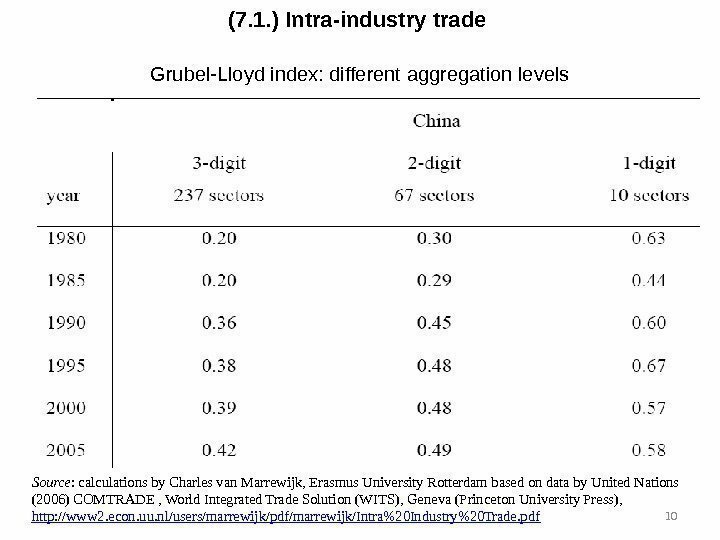 The structure and normative effects of international trade in ‘large’ economy under imperfect competition on the markets: the case of international oligopoly. (7. 1. ) 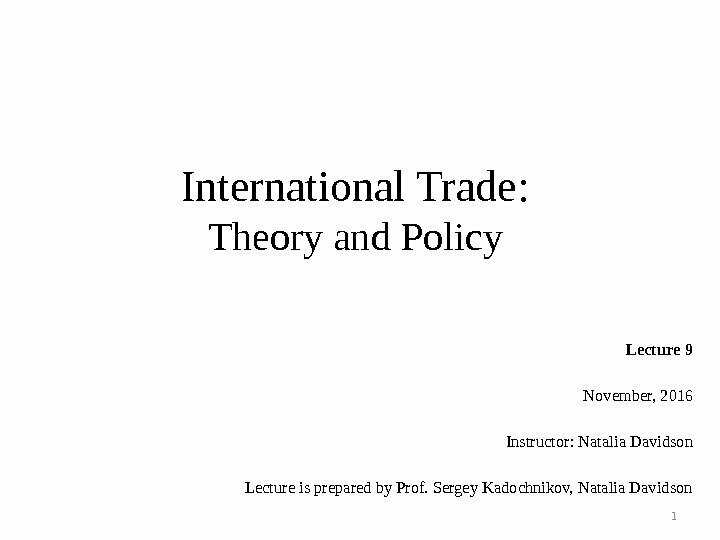 Contemporary issues of international trade: increasing returns to scale and imperfect competition — 1 • Which trends of the world economy can’t be explained using the concept of comparative advantages? 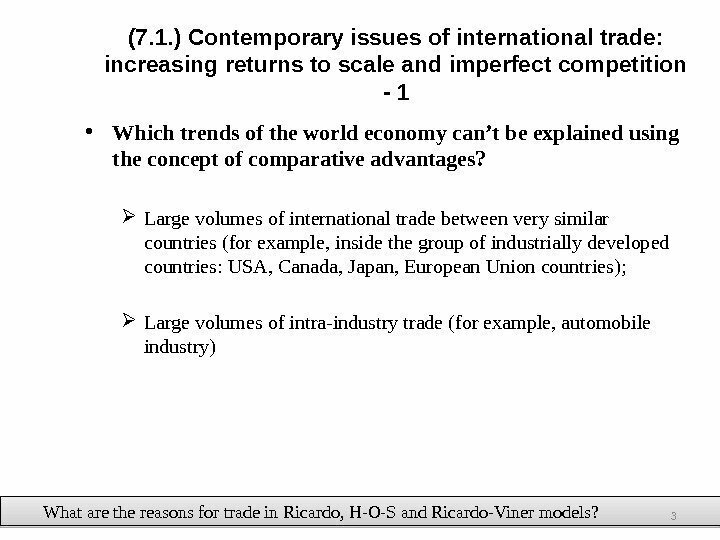 Large volumes of international trade between very similar countries (for example, inside the group of industrially developed countries: USA, Canada, Japan, European Union countries); Large volumes of intra-industry trade (for example, automobile industry) What are the reasons for trade in Ricardo, H-O-S and Ricardo-Viner models? 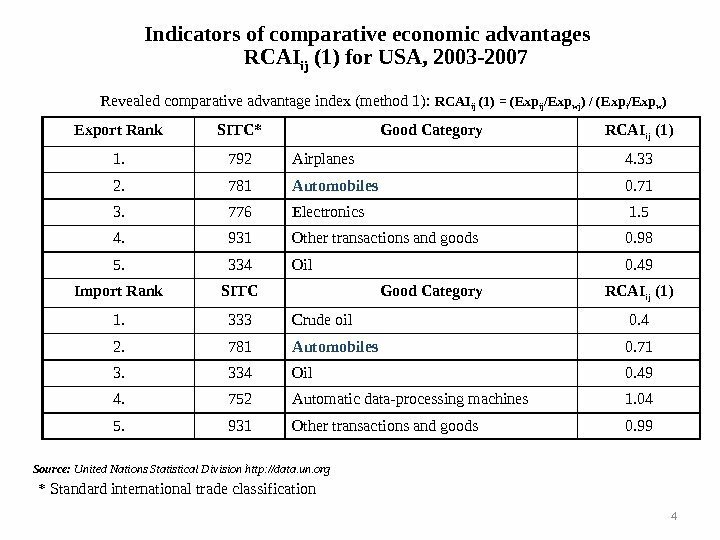 Indicators of comparative economic advantages RCAI ij (1) for USA, 2003 -2007 Revealed comparative advantage index (method 1): RCAI ij (1) = (Exp ij /Exp wj ) / (Exp i /Exp w ) Source: United Nations Statistical Division http: //data. un. org 4* Standard international trade classification Export Rank SITC* Good Category RCAI ij (1) 1. 792 Airplanes 4. 33 2. 781 Automobiles 0. 71 3. 776 Electronics 1. 5 4. 931 Other transactions and goods 0. 98 5. 334 Oil 0. 49 Import Rank SITC Good Category RCAI ij (1) 1. 333 Crude oil 0. 4 2. 781 Automobiles 0. 71 3. 334 Oil 0. 49 4. 752 Automatic data-processing machines 1. 04 5. 931 Other transactions and goods 0. (7. 1. ) 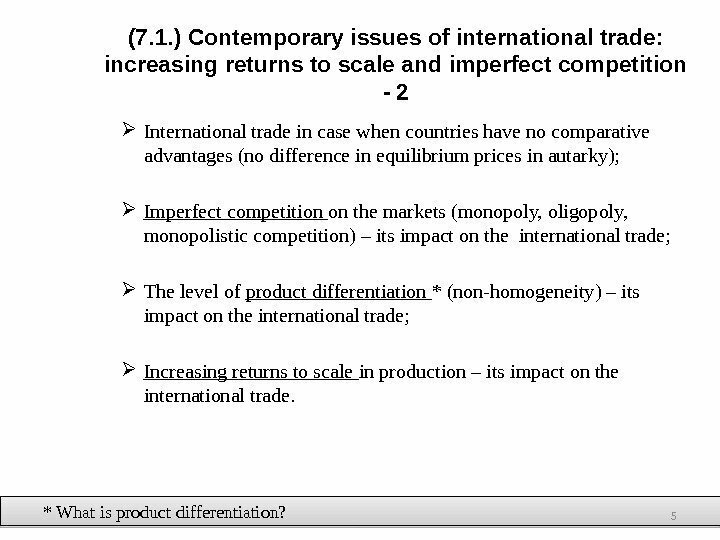 Contemporary issues of international trade: increasing returns to scale and imperfect competition — 2 International trade in case when countries have no comparative advantages (no difference in equilibrium prices in autarky); Imperfect competition on the markets (monopoly, oligopoly, monopolistic competition) – its impact on the international trade; The level of product differentiation * (non-homogeneity) – its impact on the international trade; Increasing returns to scale in production – its impact on the international trade. * What is product differentiation? (7. 1. ) 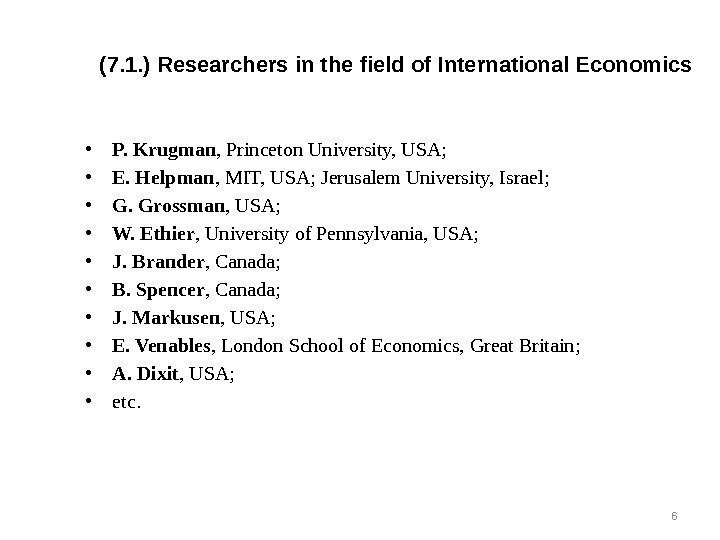 Researchers in the field of International Economics • P. Krugman , Princeton University, USA; • E. Helpman , MIT, USA; Jerusalem University, Israel; • G. Grossman , USA; • W. Ethier , University of Pennsylvania, USA; • J. Brander , Canada; • B. Spencer , Canada; • J. Markusen , USA; • E. Venables , London School of Economics, Great Britain; • A. Dixit , USA; • etc. (7. 1. ) 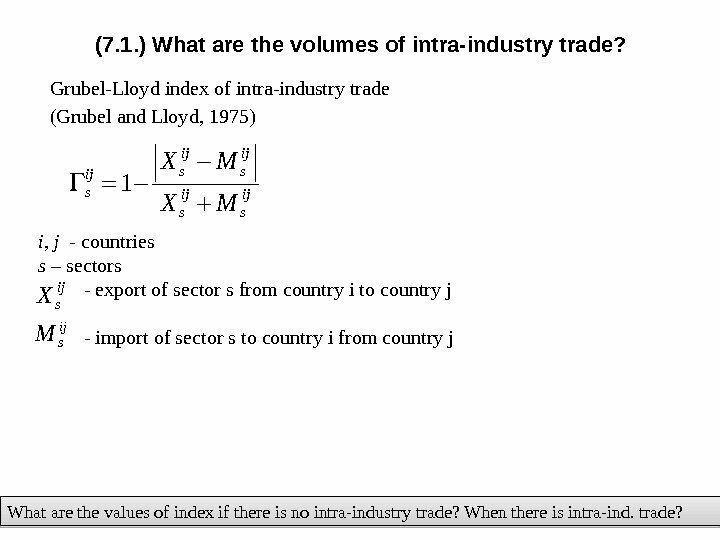 What are trade volumes between relatively similar countries? 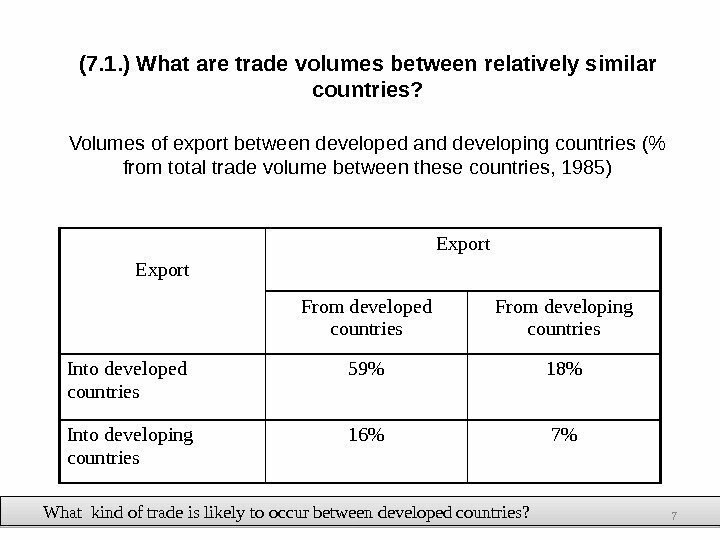 Volumes of export between developed and developing countries (% from total trade volume between these countries, 1985) Export From developed countries From developing countries Into developed countries 59% 18% Into developing countries 16% 7% What kind of trade is likely to occur between developed countries? (7. 1. ) 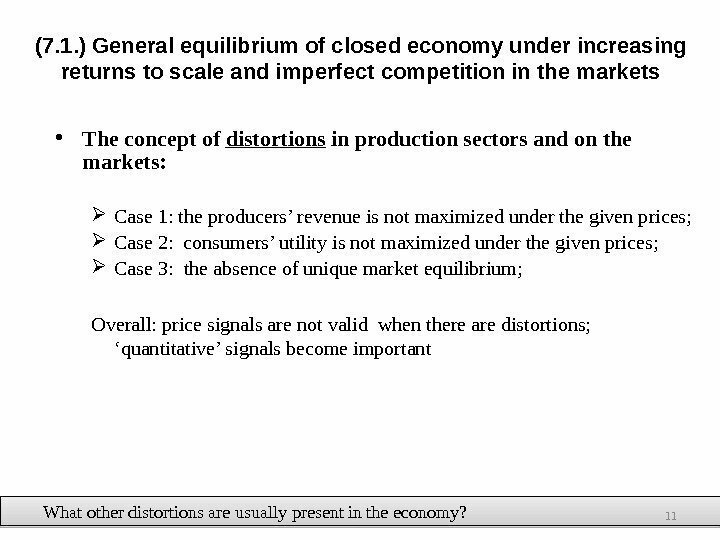 General equilibrium of closed economy under increasing returns to scale and imperfect competition in the markets • The concept of distortions in production sectors and on the markets: Case 1: the producers’ revenue is not maximized under the given prices; Case 2: consumers’ utility is not maximized under the given prices; Case 3: the absence of unique market equilibrium; Overall: price signals are not valid when there are distortions; ‘quantitative’ signals become important What other distortions are usually present in the economy? (7. 1. ) 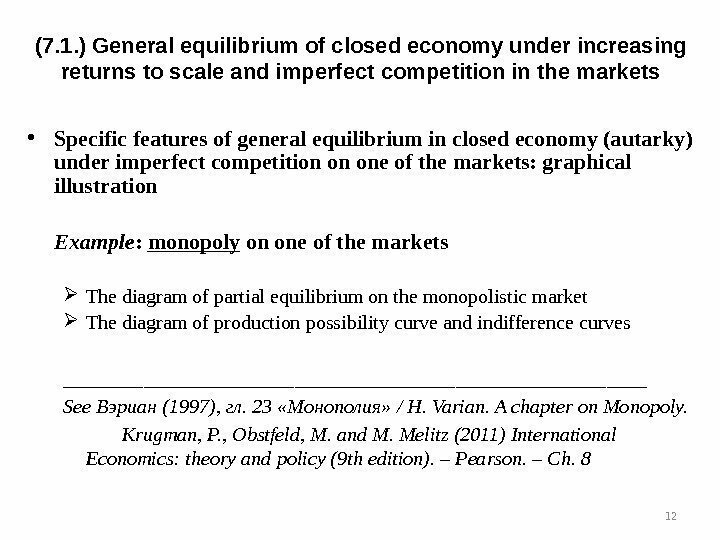 General equilibrium of closed economy under increasing returns to scale and imperfect competition in the markets • Specific features of general equilibrium in closed economy (autarky) under imperfect competition on one of the markets: graphical illustration Example : monopoly on one of the markets The diagram of partial equilibrium on the monopolistic market The diagram of production possibility curve and indifference curves _____________________________ See Вэриан (1997), гл. 23 «Монополия» / H. Varian. A chapter on Monopoly. 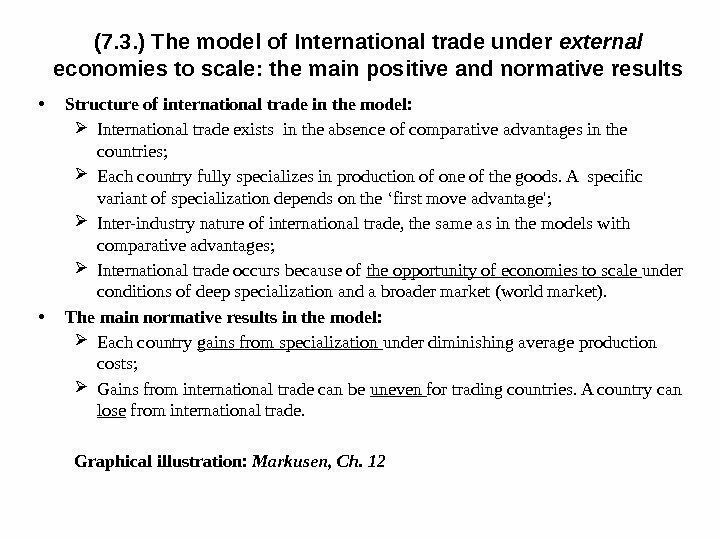 Krugman, P. , Obstfeld, M. and M. Melitz (2011) International Economics: theory and policy (9 th edition). – Pearson. – Ch. (7. 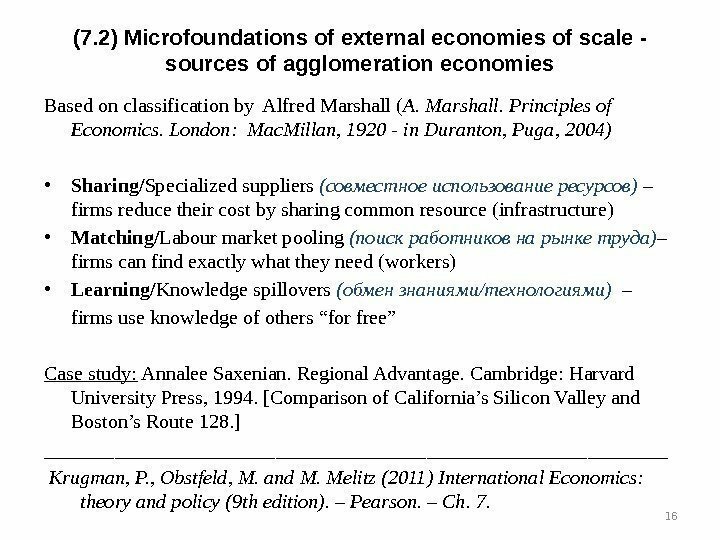 2) Microfoundations of external economies of scale — sources of agglomeration economies 16 Based on classification by Alfred Marshall ( A. Marshall. Principles of Economics. London: Mac. 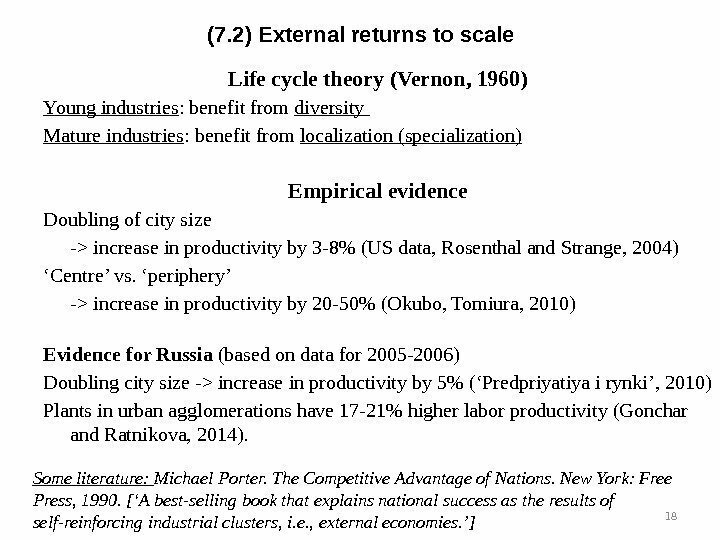 Millan, 1920 — in Duranton, Puga, 2004) • Sharing/ Specialized suppliers (совместное использование ресурсов) – firms reduce their cost by sharing common resource (infrastructure) • Matching/ Labour market pooling (поиск работников на рынке труда) – firms can find exactly what they need (workers) • Learning/ Knowledge spillovers (обмен знаниями/технологиями) – firms use knowledge of others “for free” Case study: Annalee Saxenian. Regional Advantage. Cambridge: Harvard University Press, 1994. [Comparison of California’s Silicon Valley and Boston’s Route 128. ] 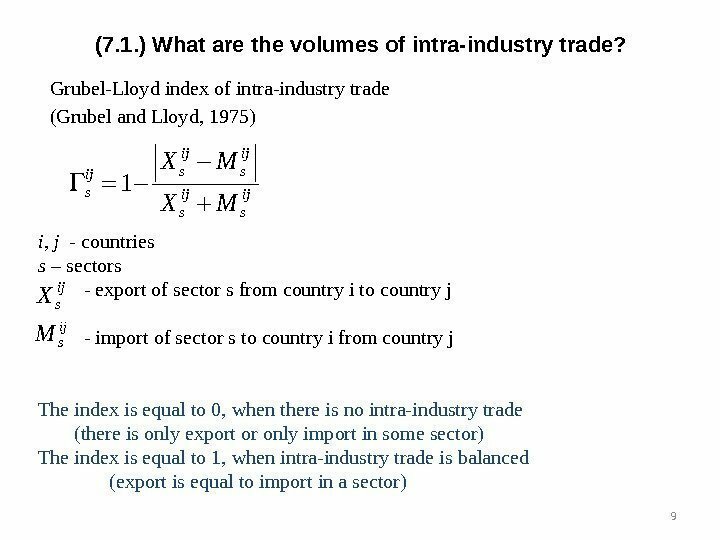 _______________________________ Krugman, P. , Obstfeld, M. and M. Melitz (2011) International Economics: theory and policy (9 th edition). – Pearson. – Ch. 7. (7. 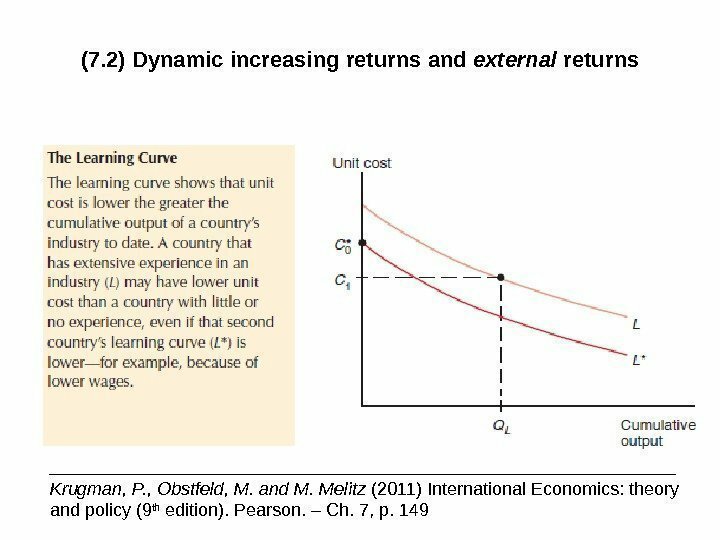 2) Dynamic increasing returns and external returns ________________________________ Krugman, P. , Obstfeld, M. and M. Melitz (2011) International Economics: theory and policy (9 th edition). Pearson. – Ch. 7, p.
(7. 3. ) 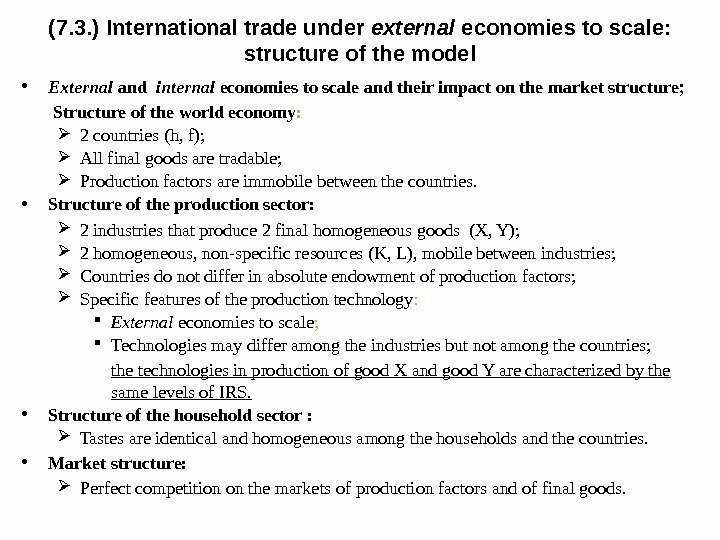 International trade under external economies to scale: structure of the model • External and internal economies to scale and their impact on the market structure; Structure of the world economy : 2 countries (h, f); All final goods are tradable; Production factors are immobile between the countries. • Structure of the production sector: 2 industries that produce 2 final homogeneous goods (X, Y); 2 homogeneous, non-specific resources (K, L), mobile between industries; Countries do not differ in absolute endowment of production factors; Specific features of the production technology : External economies to scale ; Technologies may differ among the industries but not among the countries; the technologies in production of good X and good Y are characterized by the same levels of IRS. • Structure of the household sector : Tastes are identical and homogeneous among the households and the countries. • Market structure: Perfect competition on the markets of production factors and of final goods. (7. 3. ) 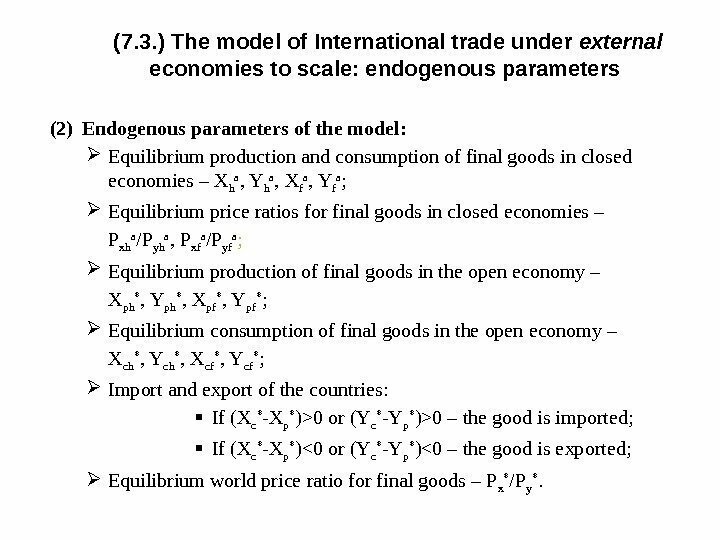 The model of International trade under external economies to scale: exogenous parameters (1) Exogenous parameters of the model: Production technologies — production functions: Х h = f xh (Q xh , K xh , L xh ) = Q xh K xh L xh (1 — ) ; Y h = f yh (Q yh , K yh , L yh ) = Q yh K xh L xh (1 — ) ; Х f = f xf (Q xf , K xf , L xf ) = Q xf K xf L xf (1 — ) ; Y f = f yf (Q yf , K yf , L yf ) = Q yf K xf L xf (1 — ) ; where = > 1, = . Resource endowment in each economy: K h , K f , L h , L f ; Preferences of representative household in each of the economies – utility functions: U i = U i (X i , Y i ); i = h, f; Market structure on the final goods markets – perfect competition. Market structure on the resource market – perfect competition. 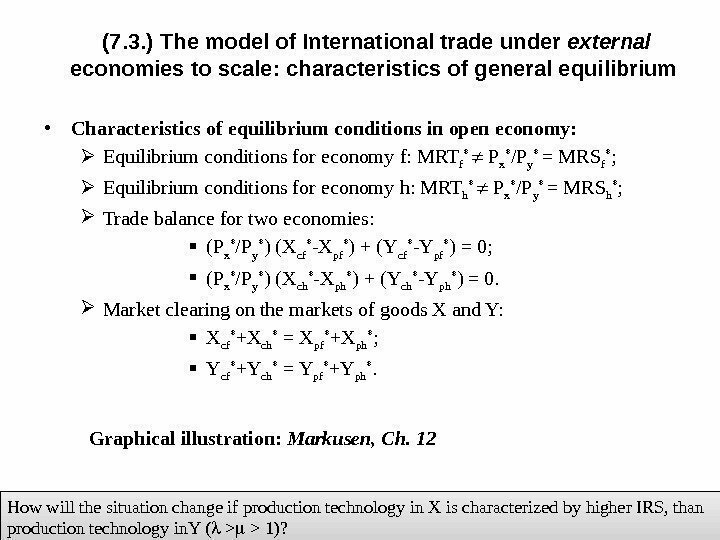 • Characteristics of e quilibrium conditions in open economy: E quilibrium conditions for economy f: MRT f * P x * /P y * = MRS f * ; E quilibrium conditions for economy h: MRT h * P x * /P y * = MRS h * ; Trade balance for two economies : (P x * /P y * ) (X cf * -X pf * ) + (Y cf * -Y pf * ) = 0; (P x * /P y * ) (X ch * -X ph * ) + (Y ch * -Y ph * ) = 0. Market clearing on the markets of goods X and Y: X cf * +X сh * = X pf * +X ph * ; Y cf * +Y сh * = Y pf * +Y ph *. Graphical illustration: Markusen, Ch. 12(7. 3. ) 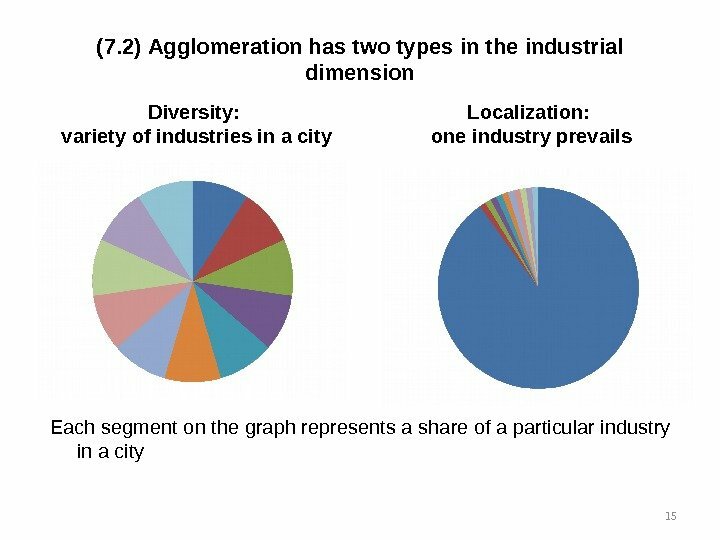 The model of International trade under external economies to scale: characteristics of general equilibrium How will the situation change if production technology in Х is characterized by higher IRS, than production technology in. Y ( > > 1)? (7. 3. ) 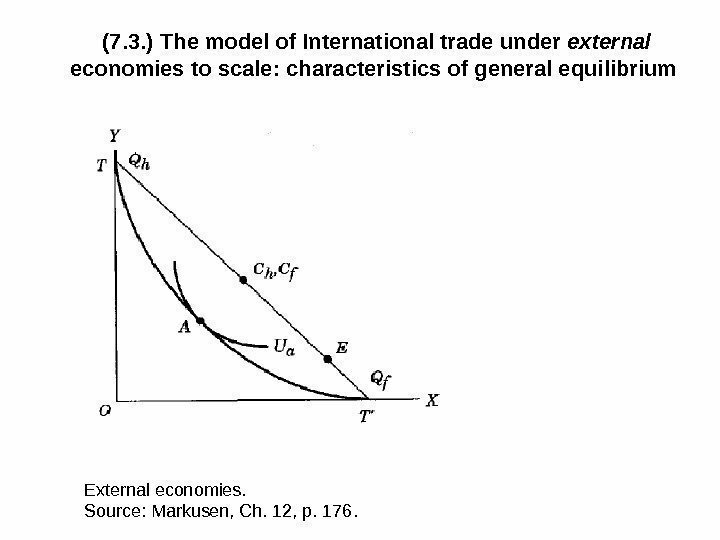 The model of International trade under external economies to scale: characteristics of general equilibrium External economies. Source: Markusen, Ch. 12, p. 176. 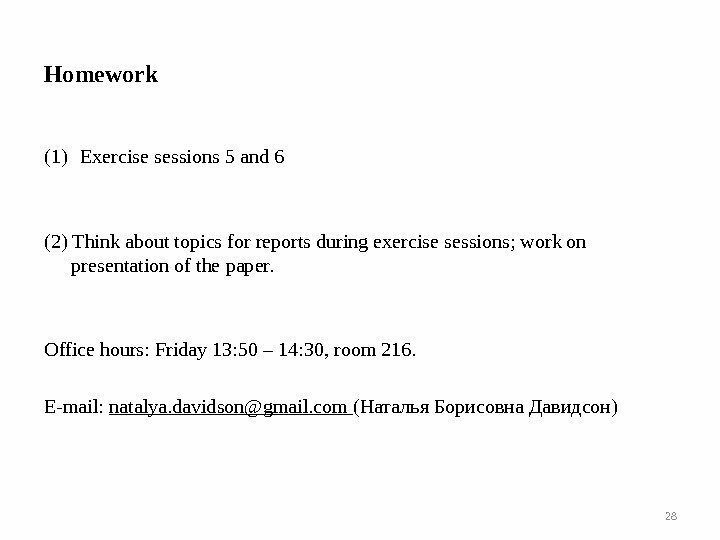 The next lecture Continuation of topic 7: Lecture 10 7. 4. Monopolistic competition , returns to scale and international trade. 7. 5. 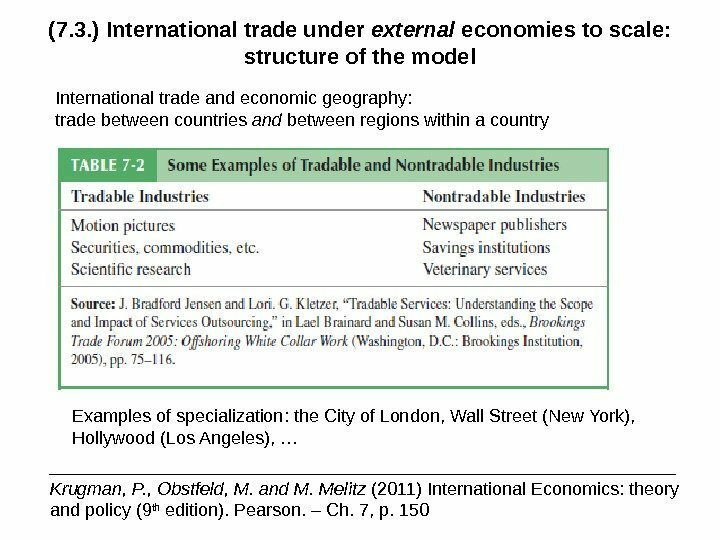 Models with heterogeneous firms (including the model by Marc Melitz (2003), models of choice between export and foreign direct investment). 7. 6. Dumping. 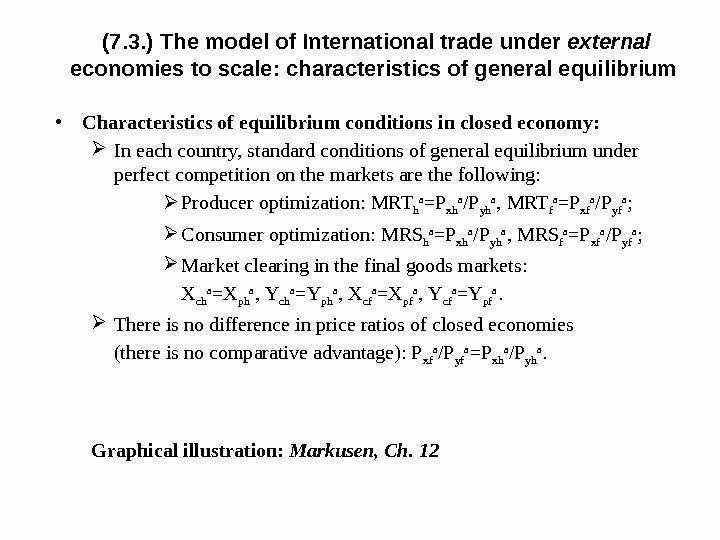 The structure and normative effects of international trade in ‘large’ economy under imperfect competition on the markets: the case of international oligopoly.